The idling equipment on compressor 1.18493 controls the delivery rate in case less air is required. A delivery pump can be flange-mounted on the compressor directly. The crankshaft is forged. All highly stressed surfaces are induction-hardened to minimise wear and tear. The connecting rods are made from die-cast aluminium. The valve blades are made from a special type of stainless steel that ensures flexibility. All of these measures ensure the compressor has a much longer lifespan. 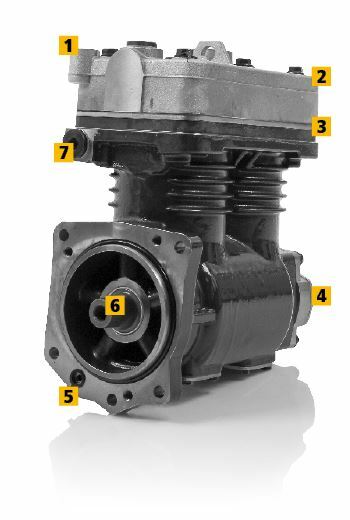 Before replacing a compressor, it should be established why the old compressor stopped working. The compressor may have stopped working due to increased air loss from the vehicle or the trailer, leading to the compressor becoming overloaded. 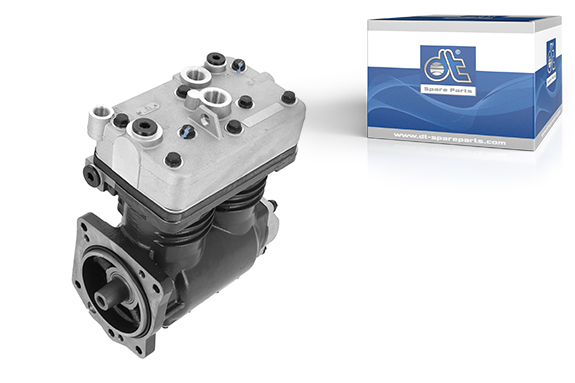 Secondly, the external air taken in may lead to increased wear and tear on the piston rings, reducing the compressor‘s performance and affecting oil delivery. If the line to the idling valve is coked, this will stop the idling valve from working. This may also stop the compressor from working. When installing a new compressor, we recommend replacing the air filter cartridges, as these are often affected if a compressor is faulty. Furthermore, the air intake should be checked for any leaks and damage, and the condition of the air filter should also be checked.